The locality of Uzana is located at the foot of Ispolin peak (1524 m). It is the widest ridge meadow of the Balkan Mountains, surrounded from everywhere by centuries-old beech forests. It is also called “the green heart of Bulgaria”. The environment there is well preserved: a lot of representatives of the protected flora and fauna an be seen. Uzana is situated between two parks: Central Balkan National Park in the west and Bulgarka Natural Park in the east. Uzana is the highest point of Himitliyski (Yasenski) Prohod (pass) between the villages of Yasenovo (the region of Stara Zagora) and Stokite (the region of Gabrovo). In 1877-1878, the troops led by General Stoletov passed through there. The road coming from Northen Bulgaria is paved, narrow and with many turns. A dirt road starts in the south. 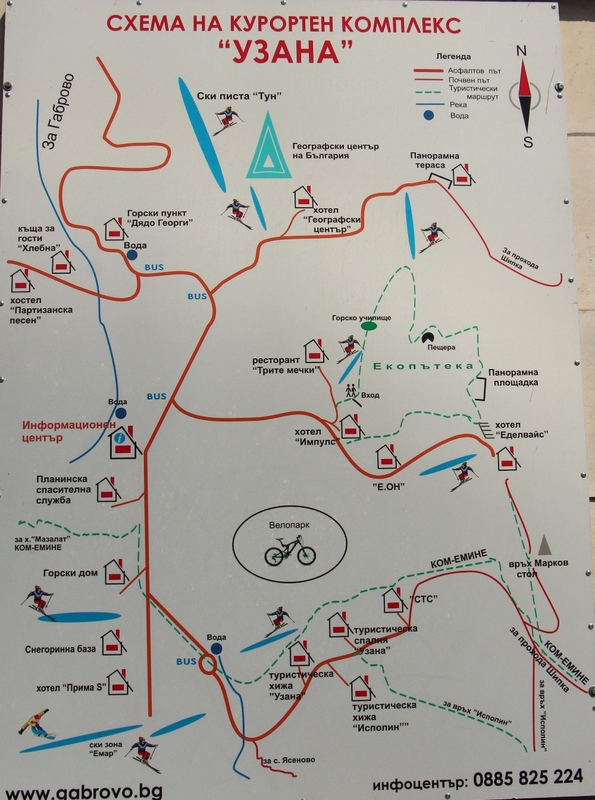 The altitude varies between 1220 m and 1350 m; the highest point is the treeless Markov Stol peak (1352 m).